Dozens of Muslim Brotherhood officials – including Supreme Guide Mohammed Badie – are being arrested by Egyptian officials for allegedly inciting violence that ended with more than 50 people dead on Monday. Most of the violence took place outside the Egyptian Army's Republican Guard headquarters in Cairo, as Brotherhood members protested last week's ouster of President Mohamed Morsi after massive popular demonstrations. Brotherhood officials blame the army for the deaths, saying it opened fire on peaceful demonstrators. Army officials say the Brotherhood plotted the violence by throwing bricks and stones, firing guns at soldiers and tossing Molotov cocktails and other weapons, said an article in the Arabic-language Alarab translated by the Investigative Project on Terrorism. An army spokesman said they would seek to charge Brotherhood officials "with trying to ignite sedition against the armed forces to the detriment of public security of the armed forces and the consequent damage to public security." It is unclear exactly what happened outside the Republican Guard building and whether the army's response was excessive. A New Yorker reporter spoke with a doctor who said he witnessed the violence outside his apartment building. He described hearing "people through megaphones encouraging jihad" and then seeing masked men on motorcycles fire guns past protesters and at the soldiers guarding the building. "Then the Army started firing. And the protestors were firing. I saw firing from both sides." A CBS News report describes videos showing "protesters on rooftops lobbing projectiles at troops below, including firebombs and toilet seats. It also showed some armed protesters firing at close range at the troops, but it did not show what the military did." Brotherhood rhetoric throughout the past week has emphasized violence over passive, peaceful protest. Morsi set that tone himself July 2 after the army issued a 48-hour ultimatum for him to leave office or negotiate a settlement with opposition leaders. "I am prepared to sacrifice my blood for the sake of the security and stability of this homeland," Morsi said in a speech that further inflamed the situation. A spokesman later added that Morsi would rather die "standing like a tree" than yield power. Similarly, the head of the Muslim Brotherhood's Freedom and Justice Party urged Morsi supporters to die defending his rule. "Now is the time for martyrdom," said Mohamed Al-Beltagy. He is among those being charged in the wake of Monday's violence. After interim leadership was announced, Badie gave a speech declaring it a fraud. "People of Egypt, those gathered in all its squares, the Brotherhood has lived with you and you with them and they served you," he said. "Morsi is my president, your president and the president of all Egyptians. God, you are the witness, all these people have gone out in the streets to support your religion and free Egypt from attempts to steal its revolution. We will remain in all the squares to protect our elected President Mohamed Morsi." An Al Jazeera report Monday also translated by the IPT said the Brotherhood was calling for an 'Intifada' against those who forced them from power. Meanwhile, the Brotherhood is rejecting a proposal to revamp Egypt's constitution and hold new elections within six months. It continues to demand that Morsi be reinstated as president. 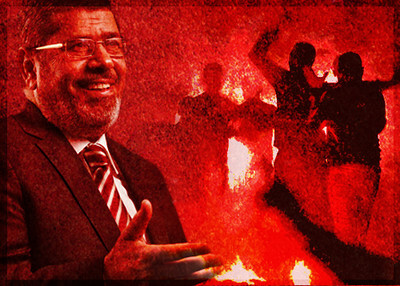 "We do not deal with putchists," said Brotherhood spokesman Tareq El-Morsi. "We reject all that comes from this coup." Gulf states are expressing their pleasure at seeing the Brotherhood forced from powering, with Saudi Arabia, Kuwait and the United Arab Emirates promising $12 billion in emergency aid to alleviate Egypt's economic crisis. A perception that Morsi failed to act enough on economic challenges, while trying to entrench Muslim Brotherhood power over that government, fueled much of the anger and protests against him. The group stands to lose even more if it continues to incite against the country's new direction. "The Brotherhood is facing a serious existential challenge," Khaled Fahmy, chairman of American University in Cairo's history department told Al-Ahram. "They can either adopt a critical attitude and ask themselves what went wrong, or blame other political forces and the whole democratic system for their own shortcomings."